The LAII welcomes Dr. Gabriela Torres-Mazuera as she assumes the role of UNM's Mexico Studies Chair in Fall 2018, a position jointly established by UNM and the COMEXUS Fulbright-García Robles program. The UNM Mexico Studies Chair position is part of a four-year agreement developed by the LAII and COMEXUS, the US-Mexico Commission for Educational and Cultural Exchange. A nonprofit organization founded in 1990, COMEXUS represents a binational effort between the US and Mexico to promote educational and cultural exchange. Its academic exchange programs for students, faculty, and researchers from both countries are governed under the Fulbright-García Robles program. UNM is one of only three US institutions collaborating with the COMEXUS Fulbright-García Robles program to offer a Mexico Studies Chair position, and Dr. Torres-Mazuera is the first scholar to hold the position. 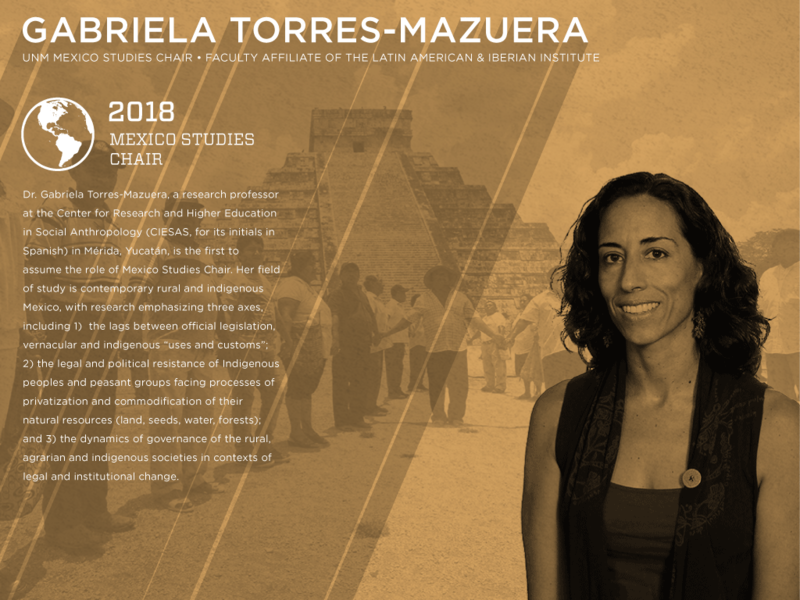 Dr. Torres-Mazuera is a research professor at the Center for Research and Higher Education in Social Anthropology (CIESAS, for its initials in Spanish) in Mérida, Yucatán. Her field of study is contemporary rural and indigenous Mexico, with research emphasizing three axes, including 1) the lags between official legislation, vernacular and indigenous “uses and customs”; 2) the legal and political resistance of Indigenous peoples and peasant groups facing processes of privatization and commodification of their natural resources (land, seeds, water, forests); and 3) the dynamics of governance of the rural, agrarian and indigenous societies in contexts of legal and institutional change. During her time on campus, she will meet with UNM graduate students and faculty, hold a public presentation (details of which are forthcoming), and teach a course on “Rural Development and Ecological Conservation in Mexico: A Critical Approach,” in the Department of Geography and Environmental Studies. In the course, she will introduce UNM students to recent anthropological debates in Mexico on rural development, ecological conservation, and socio-environmental conflicts. See the course flyer for more information. As Dr. Ronda Brulotte, LAII Associate Director for Academic Programs, shared, "We are thrilled to host Dr. Torres-Mazuera this fall at UNM. Her work is very interdisciplinary in its focus and will be of interest to students and faculty across campus. Her expertise in indigenous governance, rights and resource management in Mexico is particularly relevant to the local Southwest context."